Do you dream of a new kitchen, but don’t have the money to take on a major renovation? 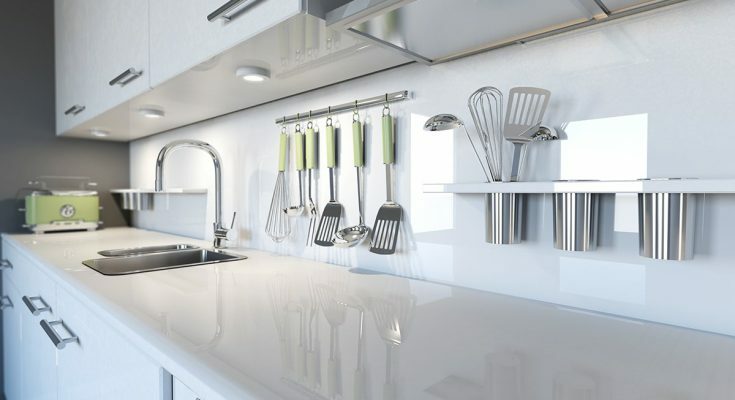 If your kitchen needs a quick makeover, look to the easily replaceable stuff to get the job done. You can improve the space you have with some of our simple design tips. It’s not that we don’t want to keep our kitchens neat and organized, but so often the hustle and bustle of everyday life gets in the way. In our haste to put the dishes away or get dinner on the table, we don’t spend quite as much time as we should putting things back in their proper place. You know this, but an actually thorough deep clean of your kitchen is enough to make it feel like it’s been revamped. Just make sure you set aside the necessary amount of time and effort. Ready, set, go! There’s nothing quite like a fresh coat of paint on your walls. And the brighter the paint you use, the bigger your kitchen will appear. Painting your kitchen white or soft yellow can brighten up space and make it look larger, crisper, and cleaner. If you are looking for a fun and exciting way to instantly update your kitchen space, we suggest testing the waters with an accent wall. An accent wall can add a stunning pattern and color to your old kitchen. Of all the kitchen paint trends, this is our favorite. Painted floors aren’t guaranteed low-cost, but they can certainly be cheaper than refinishing or replacing some so-so wood floors in an old house. Coating floors in a glossy layer of paint can really brighten things up, and if they’re glossy enough, they will be easy to clean. Grab some painter’s tape plus some pretty colors and say goodbye to boring floors forever! Most of us have stuck to the safe choice of a white ceiling in our kitchens. After all, it goes with almost everything — and a white ceiling makes a room feel bigger and brighter. A painted kitchen ceiling can also help draw the eye upward or bring high ceilings down. However, painting your ceiling a color other than white isn’t necessarily a bad choice. In fact, its dramatic effect has many design benefits. Naturally, if you’re tempted to step out of your comfort zone. New lighting is the best most effective way to brighten your kitchen. Good lighting will not only make your space feel brighter, but also more cheerful and much easier to work in. If you want a more luxury touch, try a statement light fixture. It can change the whole look and feel of your kitchen. Find something that doesn’t look out of place, but also doesn’t look like the light in every other kitchen. Another idea is to add under cabinet lighting. You can install LED strip lighting under your floating cabinets for brightening up your workspace, inside glass-fronted cabinets for a very soothing glow, or atop cabinets for ambiance. You don’t have to undergo an immense renovation to make your kitchen look brand new. If you have solid cabinet frames with little to no deterioration or damages, you can paint them to completely alter your kitchen’s appearance. Paint can work wonders on your kitchen cabinets. Once you’re done painting your cabinetry, you can add new fixtures like updated knobs and other hardware. Knob pulls are inexpensive, easy to install, and varied in style. They can add beauty and uniqueness to your kitchen space for little investment. If your space feels cramped, or if you like the open shelving look but aren’t up to taking down your floating cabinets, try removing the cabinet doors (hardware and all!). They can be put back on if you change your mind or move, or you can paint the inside of the shelves a light color for even more of the breezy feel. Pegboards are an excellent way to free up some much-needed space in your kitchen cabinets. A pegboard is a versatile board with holes to hang hooks, making it an ideal option for hanging pots, utensils, mugs, and other kitchen accessories. With the hook system, you can even hang items that do not naturally have a hooked feature. To install a pegboard, you’ll need a prefinished pegboard, a box of lathe screws, a screw gun, and hooks. A kitchen is a dangerous place for textiles — crumbs, grease, red wine spills. However, they can truly change the perception and style of your space. Sure, there are some added risks when you’ve got carpet in your cooking area—but with the right care and positioning, you can make it work. For example, if you have an island, you can fill the space around the island with decorative rugs. The key is to find the right rug that fits in with the rest of your kitchen and is easy on the eyes. If you already have a “busy” kitchen, you might want something simple. If you have an all-white kitchen, you can brighten things up with a patterned or colorful rug. Plants and flowers make kitchen physically appealing and can be beneficial for your health, too. Freshen up your kitchen by bringing the outdoors in with a new hanging herb garden. This project is a good one to build in the late winter/early spring so you can transplant the herbs outside when the growing season starts. Herbs need a lot of sunlight, so make sure the hanging garden is placed near a sunny window. Flowers of all types, shapes, and sizes, bring character and color to space. Create your own floral arrangement to complement your kitchen design. Hanging plants and ivy —especially along textured walls—will give your indoors and outdoor aesthetic. Buying and adding an orange fridge might be too bold for you, but feel free to go nuts with everything else — like a cobalt toaster, turquoise blender, or a cherry red mixer. Small colorful and decorative appliances are like jewelry for your kitchen. If at some point you do not feel like seeing or using them, you can always move them around or put them away. Coffee bars have no strict set of rules, you simply need mugs and a coffee maker, preferably an automatic one. Invest in high quality coffee maker and you won’t miss the barista when you have a dedicated spot at home for brewing your morning cup. Adding a coffee bar will freshen up your kitchen and help you entertain your family, friends, loved ones. A gallery wall might be something you think to add to your living room, not your kitchen, but believe us, this idea will transform your kitchen into a beautiful space. If a collection of prints, paintings, and photographs is too much for you, try adding one piece of art that will glam up the kitchen space — or just add a little piece that will make you smile.